Jamaica Fishing Charters: Which Boats Are Best for You? So, you have heard about the many opportunities for sports fishing in Jamaica and has booked your trip to Jamaica with the hope of enjoying this activity. You have heard of companies that offer Fishing Charters but is not sure which one you should go with. We will highlight some of the best fishing boats and Charters available to you in Jamaica. Which Boats Are Best for You? Regarding quality and durability, some of the Best Fishing Boats sailing in the Jamaican waters include the Hatteras Boat and the Bertram Fishing Vessels. The Bertram Vessel is regarded as one of the best vessels for fishing in the world and has a long history of performance and durability. The interior design of the Bertram vessel is done in such a way that it is spacious enough to accommodate all fishing equipment, coolers and other necessities above and below deck. The engines are also responsive, smooth and powerful, which results in a ride on one of these vessels being filled with fun and excitement. 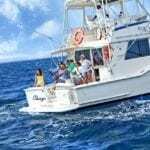 This is one of the boats used for the Deep-Sea Fishing charter offered by Island Routes in Ocho Rios, Montego Bay and Negril If you are seeking a top-quality vessel for your fishing excursion, the Bertram fits the bill in all aspects. The Bertram Vessel is regarded as one of the best vessels for fishing in the world and has a long history of performance and durability. The interior design of the Bertram vessel is done in such a way that it is spacious enough to accommodate all fishing equipment, coolers and other necessities above and below deck. The engines are also responsive, smooth and powerful, which results in a ride on one of these vessels being filled with fun and excitement. 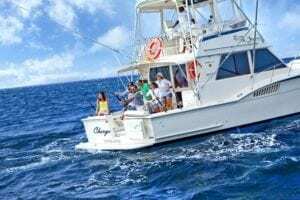 This is one of the boats used for the Deep-Sea Fishing charter offered by Island Routes in Ocho Rios, Montego Bay and Negril If you are seeking a top-quality vessel for your fishing excursion, the Bertram fits the bill in all aspects. The Hatteras Fishing Boat is another quality vessel used to carry out Fishing Charters in Jamaica. This type of vessel is as luxurious as it gets with, the boat is made from fiberglass, and the hull above the water level are balsa cored. The Boat is durable and robust, with some of the most reliable and longest lasting hulls in the business. The engines are solid and smooth and handle large waves seamlessly. When Fishing with one of these Boats, you can rest assured that the Boat will take you out and back without any issues, so you can concentrate on the task of nabbing that massive marlin! Island Routes also uses Hatteras vessels for its Deep-Sea Fishing Charters. Other companies that use quality boats for their Charters and have gotten rave reviews over an extended period includes Marlin Madness, Deep Drop Fishing Charters, Big Fish Adventures and Captains Water Sports in Montego Bay. In Ocho Rios, there are Sun Star Water Sports, Jamaican Sports Fishing Ocho Rios, Real deal Fishing Charters and Jamrock Fishing Charter. In Negril, you will find Rae’s Water Sports, Negril Deep Blue Fishing, and Heavy D’s Deep-Sea Fishing. If you are planning to enjoy Deep Sea Fishing in the unspoiled waters of Portland, the Port Antonio Deep Sea Fishing Charter has been around for a while and is highly recommended on this side of the Island. Finally, one can, therefore, see that the beautiful island of Jamaica has a lot to offer regarding quality Deep Sea Fishing Charters. Regardless of where you are staying, there is a company near to you that can provide you with a great experience. You can, therefore, book your Jamaican trip with full confidence that you will be able to enjoy top quality Deep Sea Fishing.